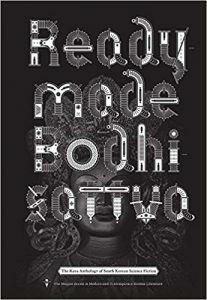 Readymade Bodhisattva: The Kaya Anthology of South Korean Science Fiction, Sunyung Park & Sang Joon Park, eds. (Kaya Press 978-1-885030-57-3, $24.95, 434pp, tp) March 2019. With Chinese SF gaining such prominence lately, and Japanese SF having been more or less familiar to Western readers for decades (I reviewed the first English-language study of Japanese SF way back in 1992! ), it’s reasonable to be curious about what else is going on in East Asia, and Readymade Bodhi­sattva: The Kaya Anthology of South Korean Science Fiction, apparently the first anthology of translated South Korean SF, provides some fascinating answers. For those of us whose exposure to the contemporary Korean imagination has been mostly limited to the inescapable (K-Pop) and the quirkily innovative (film and TV like Snowpiercer, The Host, Train to Busan, Kingdom), it’s something of a revelation, since as far as I can tell, few of these writers have appeared in English before. As with Broken Stars, the editors provide an introduction by Sunyoung Park and a closing essay on Korean fandom by Sang Joon Park, as well as detailed story introductions (some of which may be a bit too detailed, in the sense of interpreting a story before you get a chance to read it), which are mostly intended to contextualize some allusions that non-Korean readers might otherwise miss. For example, we’re told that one of the strongest stories here, Kim Changgyu’s “Our Banished World”, is actually a “fictionalization” of a 2014 ferry boat disaster in which hundreds of students drowned. While that adds an undeniable elegiac undertone to the tale, the basic mystery is set up and resolved so adroitly that fictionalization is far too restrictive a description: the high school students here live in an overprotective world in which no children have been born in more than a decade, and in which their education is entirely online (part of that overprotectiveness). 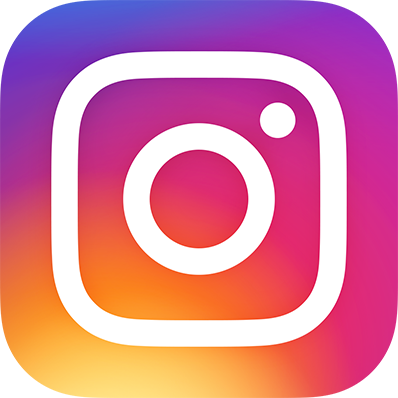 But, as savvy digital natives, they know how to hack their parents’ systems enough to learn that much is being withheld from them, and when they realize that a real-world field trip is scheduled to depart at exactly the same moment worldwide, they’re quite reasonably suspicious. The translation, by Jihyun Park & Gord Sellar, is one of the smoothest in the volume, and the story is an astute portrayal of generational mistrust in a digital world, with a resolution which, while not entirely surprising, is solid high-concept SF. In featuring adolescent protagonists, the story also prefigures what becomes a striking aspect of the anthology as a whole: nearly half the selections feature children or young adults in central roles (the editors tell us that SF was initially viewed in Korea as largely an educational tool, and I wonder if this may be partly an artifact of that). In other stories, the explanatory notes are essential. The two earliest selections, both from 1967 (the other stories date from 2005 or later), are excerpts from novels, intended to give us at least a flavor of Korean science fiction prior to its comparatively recent boom. These seem to be included for largely academic reasons, and they are frankly less readable than most of the more recent stuff. Mun Yunseong’s “Perfect Society” is from a novel about a man awakening from cryogenic sleep to find a 22nd- century world populated entirely by women, and it follows the standard guided-tour formula of much such fiction, though the author’s gender attitudes are obviously dated, and the most interesting aspects of the story are elsewhere – such as why a theater troupe spends a year rehearsing a play even knowing no audiences will show up. Choi In-hun’s “Empire Radio, Live Transmission” touches upon colonialism and Korea’s earlier subjugation to Japan in the form of an alternate-history radio broadcast promoting the restoration of such subjugation, but it unfolds less like a story than the sort of rambling, paragraph-free radio talks that generals and dictators are so fond of – and is nearly as unreadable. The third novel selection, from Kim Young-ha’s 2007 novel Quiz Show, is far more successful in giving us both the flavor of the novel and the sense of a self-contained tale, as a young man at a boot camp for potential quiz-show contestants learns the real purpose of the camp. 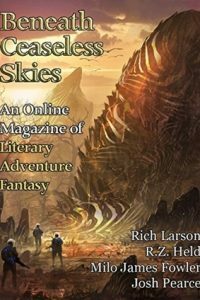 The arrangement of stories in an anthology is always somewhat arbitrary, and, like Ken Liu in Broken Stars, the editors make it clear that they’re not attempting either a “best of” anthology or a “representative” selection, which is reasonable (does any author really want to be thought of as representative of anything?) But the more-or-less chronological arrangement here has the effect of placing the most interesting and innovative stories in the latter part of the book. This doesn’t mean that the earlier selections are especially weak, though they do seem more conventional. 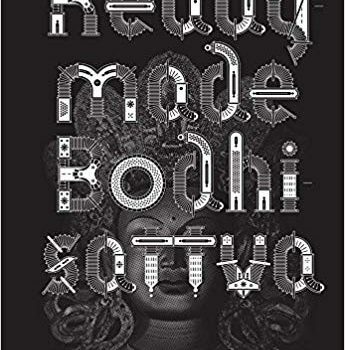 The lead story, “Readymade Bodhisattva”, essentially places Asimovian robots in the context of a Buddhist monastery, raising the pretty familiar question of whether machines can attain enlightenment; the discussions between the corporate technicians and the monks sound a good deal like those in Clarke’s “The Nine Billion Names of God”. More interesting are the robot disposal workers who patrol the heavily guarded border of a corporatized Asia in Pak Min-gyu’s “Roadkill”, perhaps the best example here of the hardboiled post-cyberpunk sensibility. Another robot story, Bok Geo-il’s “Along the Fragments of My Body”, raises the equally familiar question of whether robots can truly appreciate or create art, narrated by a bot inexplicably in the form of a 9-year-old girl (resulting in an oddly wobbly narrative voice, sometimes sounding like a little girl and sometimes like a befuddled AI). Jeong Soyeon’s “Cosmic Go” offers a more affecting narrative voice, that of a young girl whose dream of working on a moonbase seems shattered by a disabling accident, and whose Go games with her mother provide a needed perspective on her life choices. It’s one of three stories by women writers, and the only one to deal specifically and insightfully with the issue of disability. A clearer sense of the vitality and variety of contemporary Korean fiction emerges in the second half of the book. Lim Taewoon’s “Storm Between My Teeth” has something of the flavor of those stylish Korean horror films and graphic novels: a group of aliens, disguised as ordinary humans, wage among themselves a battle to the last survivor; as Sunyoung Park notes in her story introduction, it combines elements of Predator and Highlander, but adds a dimension of cultural and racial tension by having the narrator take the form of an 18-year-old Kenyan immigrant. Yet another youthful protagonist shows up in Yun I-hyeong’s “The Sky Walker”, which is probably the first SF story I’ve seen about trampolines. Its post-apocalyptic setting seems somewhat arbitrary, but the trampolining as a way of mastering gravity – and of defying adults – is given a neat, classical SF twist. The stress of adolescence – which as I’ve noted is a recurrent theme – takes center stage in Kim Bo-Young’s “Between Zero and One”, which rather elegantly counterpoints an almost scholarly discussion of the impossibility of time travel with cringeworthy episodes of dragon moms discussing how disappointing their kids are – but, as one of the younger characters observes, “the teachers are like people from another time,” teaching obsolete physics and history as seen from the 1970s. No wonder the kids want to escape into some quantum version of time travel: they’re already victims of it. 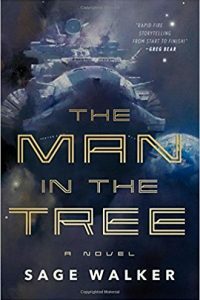 Since it’s become a convention for SF writers to employ the same universe or background for various tales, it’s not surprising to find that Djuna (a secretive popular writer who uses only the one name) has written a number of stories in the “Linker” universe, in which aliens visit Earth and introduce a virus, which transforms humans in a way that permits them to travel to the various linked worlds using alien technology. If that sounds vaguely like Pohl’s Heechee stories, it’s not the only tribute to SF tropes in “The Bloody Battle of Broccoli Plain”, a delightfully gonzo tale complete with alien invasions, giant robotic machines that transform the Earth (and which are rather waggishly named after movie stars), viral plagues, accelerated evolution, planetary adventure, and a bit of the Pied Piper as well. It’s perhaps the best example of an author reveling in the sheer possibilities of SF, though (again as the notes remind us) themes of invasion and radical societal transformation perhaps carry a particular resonance with South Korean readers. The final two stories offer the most stylistically graceful English renditions. I’ve already mentioned Kim Changgyu’s “Our Banished World”, but Kim Jung-hyuk’s “Where Boats Go”, translated by Sora-Kim Russell, is particularly haunting, and is perhaps the clearest example of the blurry line between SF and postmodern fabulism. The alien “invasion” here is frankly surreal: thousands, perhaps millions, of bowling-ball-sized metallic objects appear in mid-air, seem to spend some time examining people, and then start punching meter-wide holes in the Earth. People either fall into the holes or find themselves being herded by the objects toward the sea. The narrator, as part of the long stream of refugees, develops a tentative relationship with a young woman, and the not-quite-redemptive power of the love story eventually becomes the powerful emotional center of the tale (though the question of what these aliens are up to remains problematic). As with Chen Qiufan’s novel and Ken Liu’s anthology, there may be cultural implications barely discernible to Western readers, but there are powerful universals at work as well. Gary K. Wolfe is Emeritus Professor of Humanities at Roosevelt University and a reviewer for Locus magazine since 1991. His reviews have been collected in Soundings (BSFA Award 2006; Hugo nominee), Bearings (Hugo nominee 2011), and Sightings (2011), and his Evaporating Genres: Essays on Fantastic Literature (Wesleyan) received the Locus Award in 2012. Earlier books include The Known and the Unknown: The Iconography of Science Fiction (Eaton Award, 1981), Harlan Ellison: The Edge of Forever (with Ellen Weil, 2002), and David Lindsay (1982). For the Library of America, he edited American Science Fiction: Nine Classic Novels of the 1950s in 2012, with a similar set for the 1960s forthcoming. He has received the Pilgrim Award from the Science Fiction Research Association, the Distinguished Scholarship Award from the International Association for the Fantastic in the Arts, and a Special World Fantasy Award for criticism. His 24-lecture series How Great Science Fiction Works appeared from The Great Courses in 2016. He has received six Hugo nominations, two for his reviews collections and four for The Coode Street Podcast, which he has co-hosted with Jonathan Strahan for more than 300 episodes. He lives in Chicago. 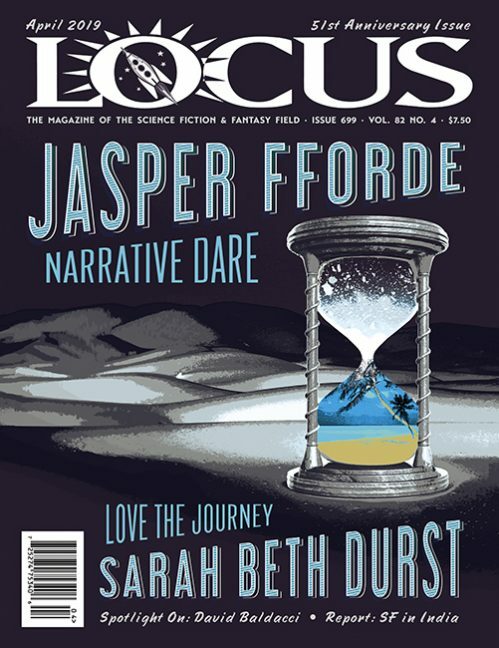 This review and more like it in the April 2019 issue of Locus.